Do the terms compa-ratio, market index, and range penetration sound complicated? Maybe a little bit mysterious? Scary even? They’re all pretty common terms for very useful information in the comp world, though they might be a tad confusing for a compensation novice. Much like imagining audience members in their undies can make giving a speech to a bunch of strangers less frightening, looking below the surface of these comp terms not only makes them easier to understand but also simpler to work with. This post will start with their definitions, then explain how they are created, and end with what they provide to you and your management team. Compa-ratio is the relationship of base pay to market expressed as a percentage of the midpoint of the salary range. Market Index is a ratio that compares a salary to the market average for that position. Range Penetration is the level of an individual salary compared to the total pay range. To determine compa-ratio, an employee's base salary is divided by the mid-point of the internal salary range for his/her position. For example, if the mid-point of the range is $50,000 and the employee’s salary is $45,000, then the compa-ratio is 90%. An external measurement, market index uses the same basic formula but with the market rate instead of an internal salary range mid-point. The market rate is data from salary surveys and can be the mean (average) of the data or the median (50th percentile). Using our example above, if the mid-point of the market is $50,000 and the employee’s salary is $45,000, then the market index is 90%. An alternative to compa-ratio, range penetration also uses a simple formula that divides the salary rate less the minimum of the range by the maximum less the minimum of the range. For example, if the range is $25,000 to $75,000 and the salary is $45,000, the range penetration is 40%. Both internal measures, compa-ratio and range penetration can be used to compare salary levels within your organization’s job grade ranges. Comparing two employees pay would simply tell you that one employee is paid a dollar amount that is less than, equal to, or more than the other. 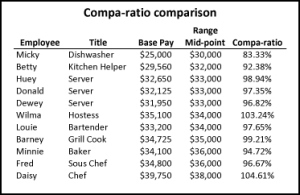 But, if your organization’s pay philosophy is to pay at the mid-point of the range for each position, then comparing the compa-ratio of all employees’ pay lets you know if you’re adhering to that pay philosophy by illustrating how many are above or below a compa-ratio of 100%. For that same pay philosophy, a comparison of range penetration across all employees illustrates which ones are in line with or are above or below the 50% mark. If your organization’s pay philosophy is to pay at a specific point of the market for each position, then comparing the market index of all employees’ pay lets you know if you’re in compliance with that pay philosophy. It shows you how many employees are being paid above or below that market point. Conducting an analysis of compa-ratio, range penetration, and/or market index can be very helpful when planning annual salary increases. They provide an indicator of where higher pay increases may be warranted for some employees as well as where gently putting the brakes on pay increases might be appropriate for others.